After your first bottle, you say “Here come the Elephants”, after about 4 or 5, you say “Here comes the twister” (see below), and the room begins to spin. 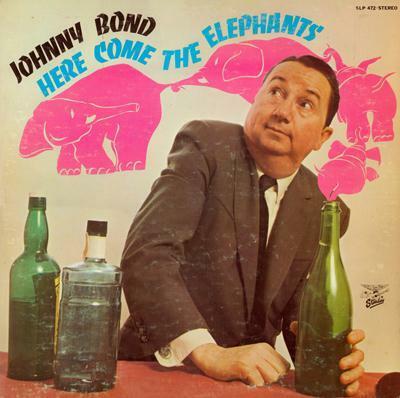 The album looks at least old enough to have Johnny Bond participate in The Iraq War Drinking Game (the first one), but in reality he was never alive for it, having died of a heart attack in 1978. Cyrus Bond (1915-1978) had a string of top-10 hits in the 1940s up until the late 50s. In 1999, he was inducted into the Country Music Hall of Fame. I had agony researching this group. I ran into a freaking domain-parked website offering info on “Po Boy”, “The Boy” and “The Po”. It is painfully obvious that someone didn’t attend their RESL classes (that’s Redneck English as a Second Language). Then there was this site. Our boyz don’t look like post-punk/hip-hop dudz, yo’. 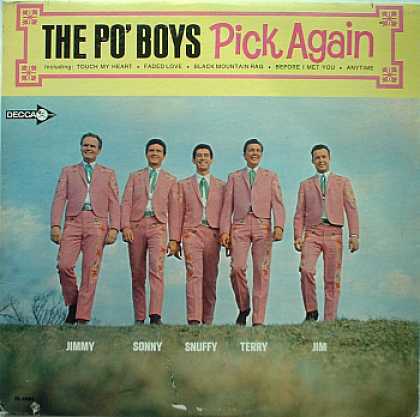 But if they were those Po’ Boys, they would have a killer logo. members who only want to be addressed by their first names. Just what we need … two guys in the band whose names are Jimmy and Jim. Look, guys, they don’t have to be your real names. I’m sure one of you wasn’t christened Snuffy!?! Could one of you have picked a different name? After a couple of pages of bizarre stuff having nothing to do with this band except the name, I gave up. But there is indeed a genre out there.